A young family move to an isolated house which the mother has been hired to restore only to discover that presences still linger casting a hold over her artist sculpturing husband. 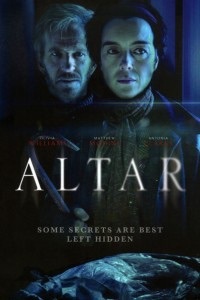 Taking a leaf from a James Herbert novel and channelling countless haunted films Altar is an effective ghost story chiller, however, what sets director/writer Nick Willing’s offering apart are the practical and some special effects which have an optical natural feel as opposed to the usual ineffective blatant CGI. Willing delivers some genuinely eerie visuals and creepy moments, this coupled with a great score and on location shoot help give some credence and atmosphere to the proceedings. Matthew Modine’s Hamilton sports a Shining Jack Torrence like woollen jumper (the writer character is replaced here by an artist) and mimics Torrence’s transformation (although quite speedy) still Modine gives an intense performance. Both the younger actors are effective, actress Antonia Clarke is notable as Penny. Olivia Williams gives convincing performance which complements the naturalistic writing and setting. While it breaks no new ground in terms of ghost stories or twist endings it’s a solid old school British horror.